With hopes of reinventing the way food is grown, Rory Aronson has developed humanity’s first open-source CNC farming machine. The FarmBot Genesis — which is currently taking pre-orders — is capable of planting seeds and then watering them precisely. Designed with the Maker community in mind, FarmBot is driven by an Arduino Mega 2560, a RAMPS 1.4 shield, NEMA 17 stepper motors, and a Raspberry Pi 3. The three-axis machine employs linear guides in the X, Y, and Z directions, which allows for tooling such as seed injectors, watering nozzles, sensors, and weed removal equipment to be accurately positioned. Impressively, FarmBot can cultivate a variety of crops in the same area simultaneously. The universal tool mount features 12 electrical connections, three liquid/gas lines and magnetic coupling. Interchangeable, 3D-printable attachments include a seed injector, a water nozzle, and a weed suppression unit for detecting and destroying infant weeds at the root. There’s also a soil sensor for measuring moisture and a camera for keeping an eye on your garden at all times. 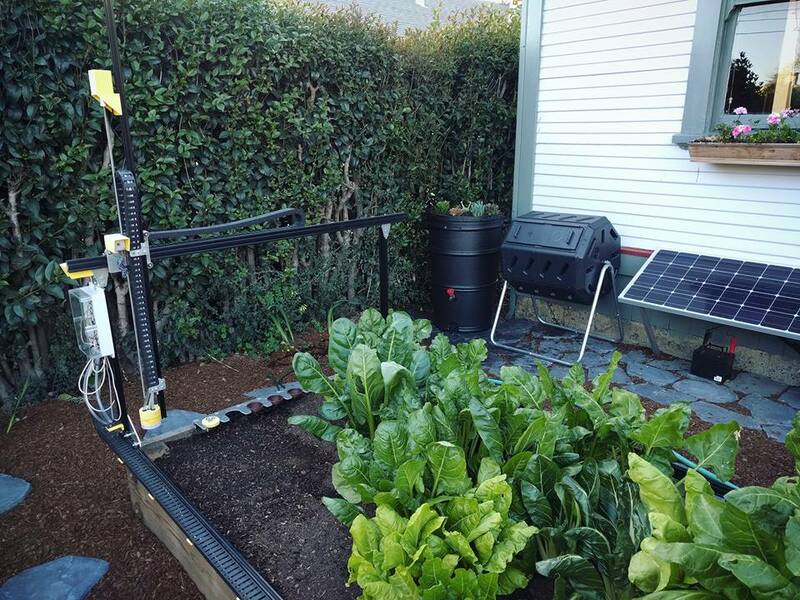 FarmBot is controlled via mobile device or laptop, while its web-based interface makes customizing your garden as simple as playing FarmVille. You can also build and schedule sequences by dragging and dropping basic operations, adjust the parameters to your liking, and save. Meanwhile, a decision support system adjusts water, fertilizer and pesticide regimens, seed spacing, timing, and other factors based on soil and weather conditions, sensor readings, location, and time of year. And of course, FarmBot can be manually operated in real-time as well. Aronson’s vision is to make precision agriculture open and accessible to everyone. Each FarmBot Genesis can be modified and augmented to suit anyone’s unique growing style and needs. For instance, you can power your machine with renewable energy from a small off-the-grid solar panel, or install a barrel to store and use rainwater. UPDATE: Aronson and the FarmBot team have already raised over $800,000 since its launch! well whats with weed ? the larger part of the work is to prepare the soil, fertilizer and humus – to water and plant the seed its nothing in compare. Hi VanceAnce, you have a point. What about an improvement project as suggested: install a simple color webcam, analyze the images via OpenCV for distinguishing leave shapes of weed from shapes of your wanted crops, and have a gripper rip out the unwanted ones? The bot knows where the plants are planted, so it should be able to automatically pull weeds not in a seeded area. Detecting green in a non-seeded area should result in a plant being pulled. The only detection needed would be near the spots where seeds were placed. When prehistoric man invented the wheel, he neglected anti-lock brakes and adaptive cruise control, but somehow, progress continued to happen. You are not going to get everything on day one. This is an open platform. Someone will develop a weed fighter module. On their website and in their documentation they include a weeder tool. On the long term removing weed in the way IPL body hair removal works could be an option. Or just simple gas burners that burn a designated area. Nice! It may be very useful for unmanned seeding in Mars (weed probably will not be a problem out there)… have you thought about that? Does NASA know your project? I really interest in this and has a plan for use it.What should i do or contact?